Control the temperature of your whole house or a single room with ducted gas heating. 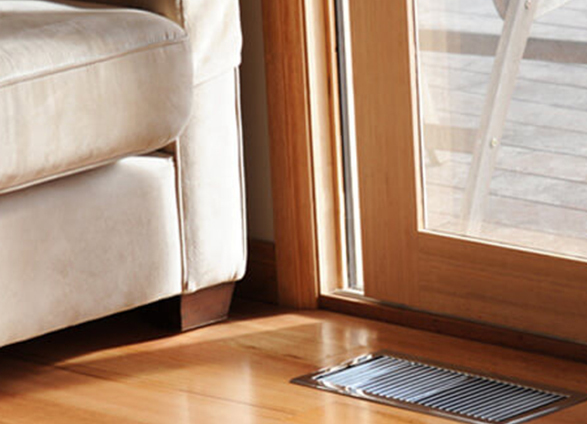 With the unit neatly tucked away out of sight, you can now heat your house in comfort and style. Brivis’ reputation for innovation, reliability and quality for over 50 years has led them to become the go-to ducted gas heating solution for Tasmanian homes and homes all over Australia. Everyone knows a Tasmanian winter is bitter cold, which is why every Brivis heater is made ‘Tassie’ proof and guaranteed to provide your home with warm, cosy air for many years. The design and manufacturing process of Brivis is accredited to the Australian Standard AS/NZS ISO9001 and their Ducted Gas Heaters come with warranties of up to 10 years. The knowledgeable staff at EGS are trained in ducted gas heating installations and are on hand to ensure total enjoyment of your new Brivis Ducted Gas Heater. If you’re uncertain about which option is right for you, don’t hesitate to get in touch. Alternatively, view the range and brochure below to browse at your leisure. To arrange a quote or simply chat to one of our professionals, call us today on 62110444. The Brivis Star Pro series is the highest efficiency ducted gas heating product we have to offer. The new range of heaters is cleverly engineered to use less gas than traditional ducted gas heating solutions. The Brivis HX range of gas ducted heating has outstanding energy efficiency ratings of up to 5.8 Stars. This is the highest ‘5 Star’ Ducted Gas Heater on the market. High efficiency is only part of the story, with the HX range also providing proven performance and reliability. The new Brivis Buffalo ducted gas heating has been designed with efficiency and reliability in mind. The perfect solution for your home heating with an all new 5 Star Energy Rating. Compact design for easy installation indoors and in tight spaces. Perfect for new homes, the CC3 is a price conscious, no fuss solution that’s easy to install.